Eight business schools at Virginia universities are listed in the 2018 national rankings released Tuesday by U.S. News & World Report. The publication ranked the University of Virginia’s Darden School of Business at No. 14 among full-time MBA programs. The College of William & Mary’s Mason School of Business ranked 57th. George Mason University’s business school was on the list but not ranked. 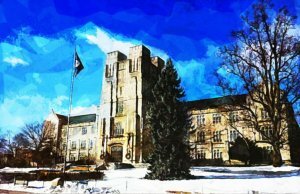 Among part-time MBA programs, Virginia Tech ranked No. 7, William & Mary ranked 16th, University of Richmond 33rd, George Mason was No. 53, Virginia Commonwealth University was 80th, James Madison University was 84th and Old Dominion University ranked No. 108. In the full-time MBA rankings, the Wharton School at the University of Pennsylvania moved up three places to tie with Harvard University at No. 1. The Booth School of Business at the University of Chicago follows at No. 3, while Stanford University, the Sloan School of Business at the Massachusetts Institute of Technology, and the Kellogg School of Management at Northwestern University tie at No. 4. Among part-time MBA programs, the Haas School of Business at the University of California at Berkeley once again claims the No. 1 title, followed by Chicago’s Booth School of Business at No. 2. The Stern School of Business at New York University and the Anderson School of Management at the University of California at Los Angeles tie at No. 3.